News: McDonald's - Holiday Pie this Winter 2010! McDonald’s is offering two new variations of the McChicken sandwich in the San Diego area: the Jalapeño Cheddar and the Cheddar Onion. It's unclear if these are merely regional items or a test for possible expansion. It might portend more McChicken versions to come. 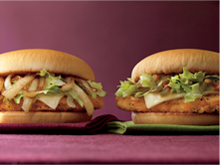 The Jalapeño Cheddar McChicken tops the McChicken patty with spicy jalapeño peppers and white cheddar cheese while the new Cheddar Onion McChicken is made with caramelized onions and white cheddar cheese. Pricing on the new sandwiches is $1.49 each. In a bit of mobile marketing, San Diego McDonald’s is offering a text message coupon for the new McChicken sandwiches. Customers can text ‘YUMMY’ to 44144 to receive a coupon for one free Jalapeño Cheddar or Cheddar Onion McChicken with any purchase sent directly to their mobile phone. To redeem the coupon, customers simply show the text message coupon on their phone to their McDonald's order-taker. The jalapeño version is quite possibly the worst sandwich I have ever eaten. I like jalapeños and I like the McChicken, but this vinegary mess was absolutely awful. I'm glad it's a limited time thing. I had the Chedder Onion in Guam. It was friggen awesome!!!! !